100 questions that take mom through childhood, starting a family, and her hopes for future generations. Fact: Moms have a million and one stories. First day of school? Remembers it like yesterday. Regrets? She's had a few. 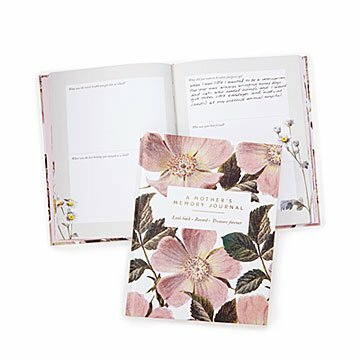 This guided journal takes mom through her childhood, starting a family, and finally her hopes for future generations. The questions range from sentimental ("Who was your best friend?") to seriously thought-provoking ("What would you like to be remembered for?"). Once completed, she'll have a beautiful way to look back on her own journey, and you'll have a beautiful way to get to know her better. Made in China. It's always difficult to shop for my sister, but this gift hit the mark! She absolutely loved it and started writing right away. It's a perfect gift for baby showers, birthdays, Christmas, anything!!! I really hope that one day my grandmother will fill the journal and pass it on to her kids so they can remember what mattered most to their mom.